Schools Matter: "Rising inequality is not about who has the knowledge; it's about who has the power." "Rising inequality is not about who has the knowledge; it's about who has the power." Paul Krugman turns his attention today to the "deeply unserious fantasy" promoted by the corporate education dissemblers and diversionists, who have made careers and millions from pretending that inequality is a schooling issue and that education will solve all the problems that poverty, classism, and racism have created. This dangerous myth is perpetuated by billionaire backers of profiteering charter groups such as the Knowledge is Power Program (KIPP). Can the lie be made more figural than that name!
. . . .there’s no evidence that a skills gap is holding back employment. After all, if businesses were desperate for workers with certain skills, they would presumably be offering premium wages to attract such workers. So where are these fortunate professions? You can find some examples here and there. Interestingly, some of the biggest recent wage gains are for skilled manual labor — sewing machine operators, boilermakers — as some manufacturing production moves back to America. 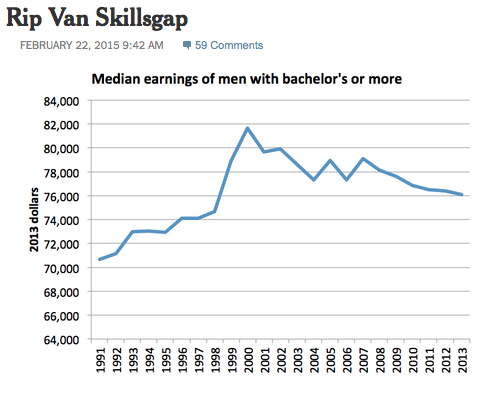 But the notion that highly skilled workers are generally in demand is just false. Finally, while the education/inequality story may once have seemed plausible, it hasn’t tracked reality for a long time. “The wages of the highest-skilled and highest-paid individuals have continued to increase steadily,” the Hamilton Project says. Actually, the inflation-adjusted earnings of highly educated Americans have gone nowhere since the late 1990s [see chart below]. "This time, the evasion involves trying to divert our national discourse about inequality into a discussion of alleged problems with education."